Franschhoek is the food and wine capital of South Africa, and a food-lover’s dream destination. The town is home to some of the finest restaurants in the country, serving cuisine inspired by the area’s French heritage. 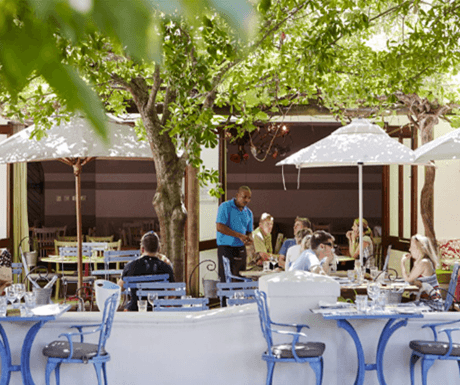 If you’re a foodie on holiday in Franschhoek, a visit to one of these top restaurants is a must. Here are five ‘tried and tasted’ restaurants whose signature dishes will leave your tummy full and your taste buds yearning for more. Situated on a quaint family farm, Bread & Wines Restaurant is known for its charm and character. The restaurant’s culinary delights are whipped up by chef and owner, Neil Jewell, whose dishes are a blend of European and South African flavours. The restaurant has won a number of awards over the years, and in 2013 Neil won an award for his handcrafted charcuterie. Open daily for lunch, it’s the ideal spot to enjoy a meal and a glass of wine in between sightseeing. Rupert and Rothschild is a name synonymous with South African wine, and the winery’s restaurant produces cuisine that complement their premium wines. The restaurant overlooks the lush vineyards and the Simonsberg Mountains – the perfect place to enjoy good food and wine. The Chef’s Menu features some of the tastiest local and international delicacies, including cured tuna and Karoo lamb. If you’re looking for a unique dining experience, the restaurant’s champagne, wine and food pairings are a great opportunity to indulge in delicious food while sampling the winery’s top produces. Foliage is a restaurant styled to look and feel like a contemporary farmhouse. The cuisine is unique in that the menu varies depending on which edible plants and mushrooms Chef Chris Erasmus can forage. Chris is known for his creative flair, which is evident in the dishes he prepares. He is passionate about finding and trying any earthy ingredients he can scour in the hills surrounding the restaurant. Dishes you can expect to see on the menu include smoked yellowtail, Franschhoek trout and braised kudu shank. If you’re looking for fuss-free yet sophisticated dining, look no further than Ryan’s Kitchen. Chef Ryan Smith is constantly working to create the finest fusion of South African and cosmopolitan dishes. These meals reflect the history and culture of the country, and each dish offers a taste of South Africa. You can choose a delectable dish from the menu, or you can opt for the Chef’s Selection – a stellar 4-course menu. With a new menu every two weeks, you will always be spoilt for choice. Grande Provence is a historic wine estate boasting hectares of vineyards and the finest Cape Dutch architecture. Their top-notch wines are paired with excellent food at The Restaurant, situated on the estate. Charred yellowfin tuna, tempura oyster, and rose and white chocolate macaroons are just a few of the dishes you’ll find on the menu. If you’re looking for something a little bit more romantic, you can order a traditional French-inspired picnic lunch. Each course is paired with Grande Provence’s delectable wines, as well as international wines. The Restaurant is open every day for lunch and dinner. Have not been to either of them, but I’ll definitely check them out on my next trip to Franschhoek. Thanks for sharing.